Ocotillo (Fouquieria splendens) are one of easiest plants to identify in the desert. They are a large shrub with long cane-like unbranched spiny stems that grow from a short trunk. Small 2 inch leaves will grow from the stems when there is enough moisture. Dense clusters of red tubular flowers grow from the end of the stems from March through June. Ocotillo are common in most areas of the Sonoran and Chihuahuan deserts. They are also found in western Texas through to southern California. 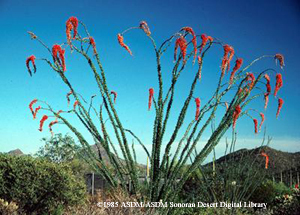 Ocotillo can reach heights of up to 20 feet. The Ocotillo is called many different names including Candlewood, Slimwood, Coachwhip, Vine Cactus, Flaming Sword and Jacob's Staff. The Ocotillo is often use as "fencing" because its spines stop people and animals from passing through.